2013 may be a ground-breaking year in the history of the Kentucky Derby. Anna Rose “Rosie” Napravnick could become the first woman in the race’s 139-year history to take first place in the event on the horse Mylute. The 25-year-old Napravnick has been racing since a young age. She first entered the horse racing under the first name of “A.R.” so no one would know she was a woman in 2005. However that quickly ended as she began to accumulate numerous wins in her races. Napravnick won one of horse racing’s most important races in 2012, the Kentucky Oaks. Riding Believe You Can, Napravick won the Kentucky Oaks after placing second in 2011. 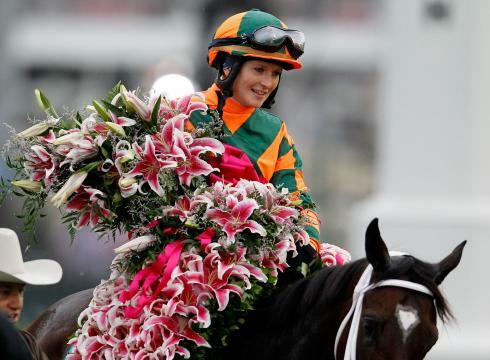 The win garnished her with a huge garland of lilies, as is tradition for the race, along with the Kentucky Oaks. Napravnick has taken on the rough sport with a sense of grit and determination. She has suffered four injuries in her career, including breaking her left leg in August of 2008. If she wins she will achieve a goal that six other female jockeys have not accomplished in the previous 138 Kentucky Derbies. This will be her second trip to Churchill Downs however. Two years ago Napravnick placed ninth in the Kentucky Derby, the best finish by a female jockey in the events history. Napravnick and Mylute currently have 13-1 odds.